Truck weighing machines, which determine the exact weight of trucks, will become operational from Friday. NEW DELHI: In a bid to curb the movement of overloaded trucks in the capital, Delhi government’s transport department has installed Truck Weighing Machines in Dwarka, Burari and Sarai Kale Khan. These machines, which determine the exact weight of trucks, will become operational from Friday. Until now, the transport department did not have weighing machines of its own and trucks had to be taken to private facilities for weighing the excess load and penalising the vehicle owner. The department has now installed ‘mounted weighing machines’ at three impounding pits in the city. The facilities at Burari and Dwarka are capable of weighing trucks of up to 100 tonnes, while the facility at Sarai Kale Khan can weigh up to 60 tonnes. Approximately one lakh goods vehicles, including trucks of all sizes enter the capital every day. 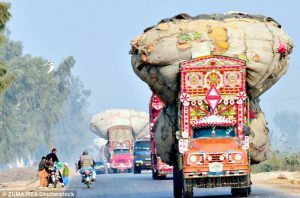 “Overloaded trucks add to air pollution in the city as emissions from such vehicles is significantly higher than trucks weighing within the prescribed limits,” said a transport department official. “These overloaded trucks, which include multi-axle trucks and trailers, come from neighbouring states and usually carry construction material or scrap. We have deployed 10 teams of the enforcement wing at major borders of Delhi to check such vehicles,” he added. Private weighing machines usually have a limit of 50 tonnes and most overloaded trucks weigh more than that. To overcome this, our new weighing machines have the capacity to weigh up to 100 tonnes at Burari and Dwarka and 60 tonnes at Sarai Kale Khan,” the official said. While the prescribed limit is 16 tonnes for smaller trucks, 25 tonnes for trucks with 10 tyres and 35 tonnes for trucks with 14 tyres, trucks are usually found weighing more than 50 tonnes. As the weighing capacity at private facilities is limited, it becomes difficult to calculate the exact excess weight of trucks as large weighing machines are not available in the city, the official said. Currently, overloaded trucks are allowed to leave after paying a fine, but with the department’s weighing machines now in place, it will become mandatory for truck owners to offload the extra goods to another vehicle. “They will be penalised Rs 2,000 for the first extra tonne of goods and Rs 1,000 for each successive tonne,” he said. The department also plans to install cameras at these facilities. “Since truck owners will have to arrange separate vehicles for offloading extra goods, photographs will be taken of the trucks before and after offloading for proof,” the official said.